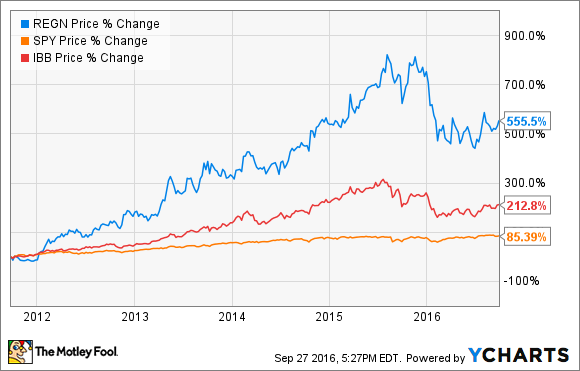 Why Investors Are Paying a Premium for Regeneron Pharmaceuticals, Inc.
Regeneron Pharmaceuticals stock is far more expensive than its peers. Here's why. Regeneron Pharmaceuticals (NASDAQ:REGN) has rewarded long-term investors with some outstanding gains, despite a dramatic tumble to begin the year. Shares of the drugmaker have risen about 555% over the past five years. The Regeneron rocket leaves the benchmark S&P 500's 85% return over the same period in the dust, and it's more than double the 213% gain posted by its industry-tracking iShares Nasdaq Biotechnology index. While the average stock in the S&P 500 sports a trailing PE ratio of about 24.8, Regeneron Pharmaceuticals shares are trading at a sky-high multiple of 66.9 times trailing earnings. Clearly investors are expecting some dazzling growth in the years ahead. Read on to see what they're looking forward to. Eylea is an increasingly popular treatment that slows the progression of several conditions that lead to vision loss, and it's currently responsible for nearly all of Regeneron's product sales. Since its first FDA approval in 2011, Eylea sales in the U.S. have soared to $1.61 billion in the first half of this year, a 34.8% increase over the same period last year. Outside the U.S., Germany's Bayer markets the eyeball injection, and sales are booming. In the first half of the year, Regeneron's share of profits from the partnership jumped 60% over the previous year period to $313.3 million. One of the reasons Regeneron is trading at such a high multiple is because it's been funneling Eylea proceeds into expansion of its product lineup. Although sales rose sharply in the first half, increased expenses associated with developing and commercializing drugs in partnership with French pharma giant Sanofi (NASDAQ:SNY) led to a slight decrease in operating profit compared to the previous year period. The first high-profile drug to emerge from the partnership, Praluent, is a next generation cholesterol-lowering injection expected to reach over $3 billion in annual sales. Unfortunately, it also has a big price tag that has limited its uptake. Although it was the first drug of its class to earn FDA approval last July, net sales of Praluent were just $37.4 million in the first half. Its launch could receive a shot in the arm next year. The partners are running an 18,000 patient trial to determine if the therapy actually lowers the risk of a second heart attack. If the results are positive, they could justify Praluent's $14,600 per year price tag, and help it reach its lofty sales estimates. While they're waiting for Praluent results, the partners have plenty to look forward to. The FDA is currently reviewing sarilumab, a protein that blocks a pathway highly correlated with inflammation and joint destruction in rheumatoid arthritis (RA) patients, and the partners expect a decision by the end of October. One of the most popular RA treatments, AbbVie's Humira, is the world's top selling drug, with second quarter sales that suggest an annual run rate of more than $16 billion, and sarilumab wiped the floor with it in a head-to-head trial. Earlier this year, Regeneron and Sanofi posted results that showed RA patients receiving sarilumab produced a 46% stronger decrease in disease activity than patients taking Humira after 24 weeks. These results don't mean sarilumab will surpass Humira's popularity, but with results like these its chances of passing the $1 billion-per-year blockbuster mark seem solid. If approved, sarilumab will enter an increasingly crowded field -- but the partners have another new drug candidate under FDA review that could launch into the clear blue sky. Dupilumab would -- again, if approved -- become the first effective treatment for a large, under-served group of people with a serious form of eczema known as atopic dermatitis. The disease affects an estimated 7 million to 8 million Americans, and there are approximately 1.6 million diagnosed with uncontrollable moderate-to-severe symptoms. This spring, Regeneron and Sanofi showed patients with moderate-to-severe atopic dermatitis treated with dupilumab benefited significantly compared to those receiving a placebo. This being the first therapy to produce such a benefit, the FDA recently granted its application a priority review, with a decision expected before the end of next March. With such a large unmet need, dupilumab peak annual sales estimates as high as $4 billion aren't that farfetched. The future of dupilumab and sarilumab are far from certain, but considering their potential, the premium investors are willing to pay for Regeneron Pharmaceuticals stock isn't that outrageous either.